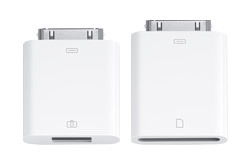 Apple on their iPad page released some info on a camera connection kit for the iPad. It will allow you to hook up a SD card or camera via USB to the iPad. I wish it wasn’t a adapter since they are so easy to lose but at least the functionality is there. Another feature that I have been waiting to hear about is the ability to hook up a flip video and do some minor video editing. I’m hoping since they have a camera connection kit it will be possible.